florida girl in dc: Food Blogger Bake Sale THIS SUNDAY! Food Blogger Bake Sale THIS SUNDAY! Are you going to be in DC this weekend? 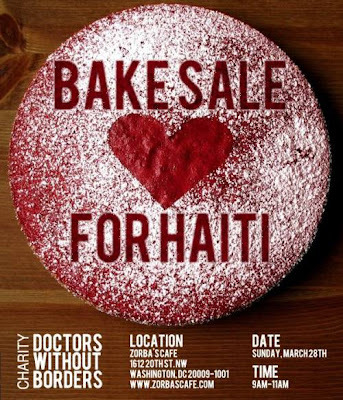 Come on down to Dupont Circle - and on your way to or from the Dupont Circle Farmers Market, pop by our Bake Sale for Haiti on the patio of Zorba's Cafe! In addition to seeing your favorite blogger's smiling faces before 11am (uh-hem, like mine), we'll be donating all money raised to Doctors Without Borders. As a Florida girl, I know that living outside on an island a tent during hurricane season isn't anyone's idea of safe or fun. Doctors Without Borders are on the ground helping treat everything from post-operative wounds to psychological care to sanitation-related malaria. Now's the time to dig out the change from your sofa, come on down and stock up on muffins, cupcakes, cookies and other goodies.